When Southwest announced new service from Boston’s Logan Airport, many wondered how competitors in Beantown would react. Well, now we have our answer. 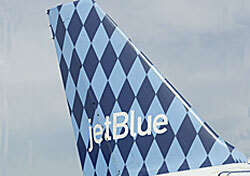 On September 9, JetBlue will launch new service from Boston to Baltimore, with introductory fares from $39. This means JetBlue intends to battle Southwest head to head on both nonstop routes Southwest will serve from Boston (JetBlue already flies to Chicago, which is Southwest’s other planned nonstop route). And in case you’re keeping score, that $39 fare is $10 cheaper than Southwest’s introductory price. As I wrote when Southwest revealed details of its service from Logan, Boston is one of JetBlue’s primary focus cities—in fact, Logan is JetBlue’s second busiest airport, behind only New York. And with Southwest flying only two nonstop routes from Boston, there’s really no excuse for JetBlue to compete on both. That said, JetBlue likely has little to gain beyond the business travel market between Boston and the D.C. area (it’s worth noting that JetBlue already flies to Dulles). Southwest is certainly looking to snag a share of this market, but it will largely use Baltimore as a connecting city to dozens of other destinations it serves. JetBlue can’t come close to matching that, but it can steal some of the business traffic Southwest is hoping to pick up. For business travelers flying in a poor economy, I would imagine JetBlue, with its broader selection of perks and similar pricing to Southwest, is the more attractive choice. In spite of that, and perhaps because of it, JetBlue wants Southwest to know who’s the low-cost king in Boston. And considering JetBlue offers nonstop flights to around 30 cities from Boston, compared to Southwest’s two, JetBlue’s status is not exactly up for debate. But with this new route, JetBlue is making sure Southwest gets the message anyway—just in case.